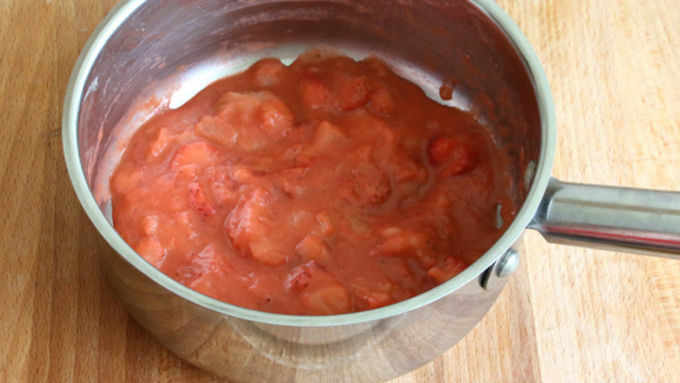 Place the strawberries and rhubarb in a saucepan along with the butter and cook over medium-high heat until soft, about 4-5 minutes. 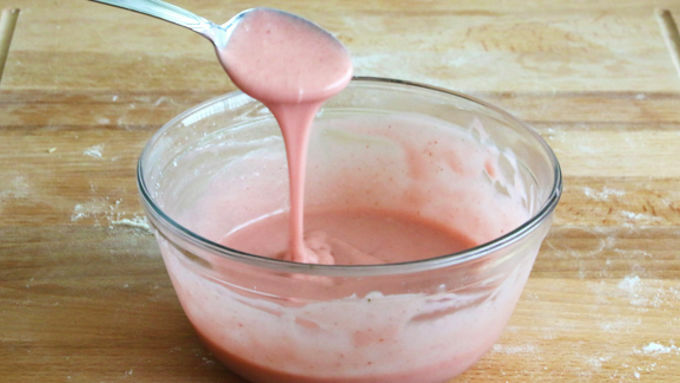 Place the strawberry/rhubarb mixture in a food processor with the heavy cream and vanilla extract and puree until smooth. Return the mixture to the saucepan and heat it until very hot but not boiling. Remove it from the heat and whisk in the white chocolate chips until smooth. Refrigerate until chilled. Once chilled, whisk in the powdered sugar until smooth. Set aside until ready to use. Will keep in the fridge for up to 3 days. To make the donuts: Sprinkle some flour on your work surface. 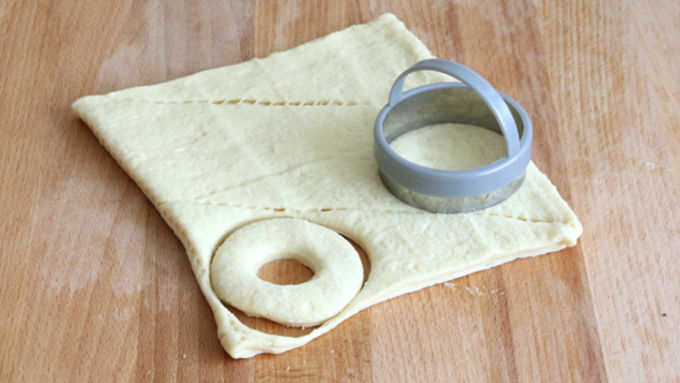 Roll out the tube of dough but don't separate it.Fold it over along the middle seam. Using a biscuit cutter or a glass, cut circles out of the dough at the widest point of each triangle. Use a smaller circle to cut out the donut hole. Scoop up the scraps of dough, reshape them into a ball, and roll it back out to the same width as the original square. Cut more donuts out. You'll end up with 7 donuts per tube of dough if you're using a 3 inch diameter cutter. Heat the oil in a saucepan to a depth of at least 3-inches (or use a deep fryer). The temperature should be between 360°F and 375°F. Drop a donut into the oil and let it fry on one side until golden brown, 30-60 seconds. Then carefully flip the donut over and fry the other side until golden brown. Note: If the oil is hot enough the donut will not become saturated with oil. The high heat will immediately seal the outside of the dough, preventing the oil from seeping in.Remove the donut to a wire rack or a paper towel-lined plate while you fry the remaining donuts. 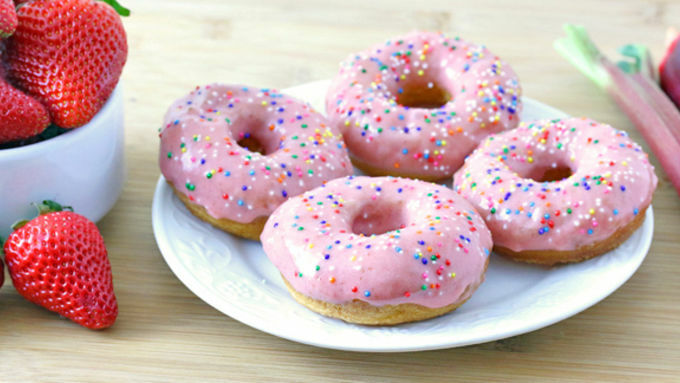 Dunk the donuts into the glaze and place them back on the rack or a plate for a few minutes to allow the glaze to set. Add some sprinkles if desired. 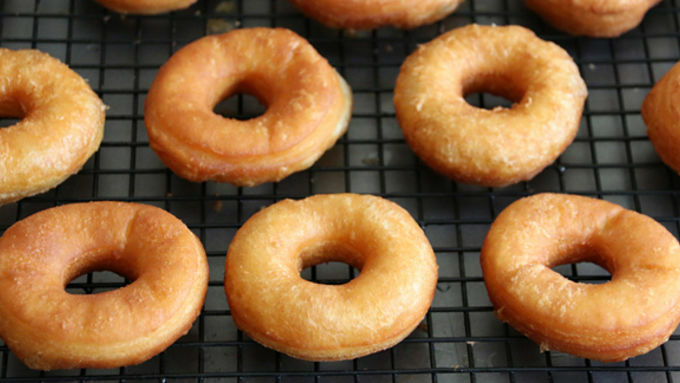 You'll want to make these donuts immediately. They're THAT good! It’s 8:37pm. You’re in the middle of watching your favorite show. And then it happens. Out of nowhere. You didn’t ask for it. You’re not to blame. But it happens nonetheless. The craving hits. The donut craving. You know the one. You look at your watch. Yep, 8:37pm. Dang it. The thought of getting in your car and driving to your local donut joint (if they’re still open) is almost as repelling (almost) as the thought of donuts is enticing. You drum your fingers beside you on the couch, bite your lower lip, and sink down further into the cushions of despair. DON’T be a victim again. Take CONTROL of your cravings, your circumstances, your LIFE. ALWAYS have a tube of Pillsbury Crescent Dough and some ready-made strawberry rhubarb glaze in your fridge and YOU’RE SET. It’s now 8:47pm. 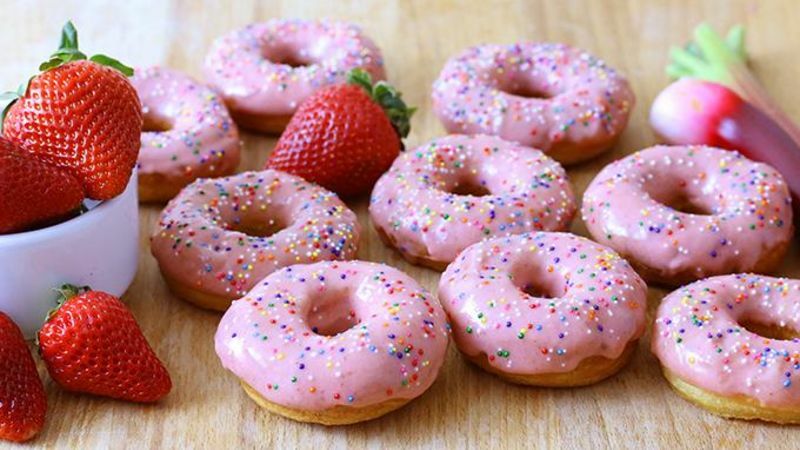 And you sit down with a plate of freshly made Strawberry Rhubarb Glazed Donuts. You sink your teeth into them. And smile. Enjoy! You will, I promise.